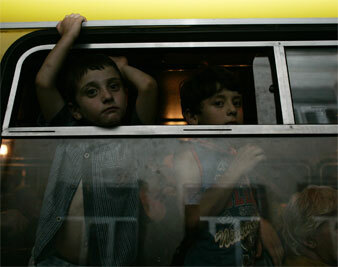 Reuters Pictures Refugee children stare out from a bus on a stop for food in a Georgian village. After nearly two weeks of war, most of Georgia remains in chaos. A bridge thirty miles west of the capital city of Tbilisi was blown up on Saturday afternoon, severing the country’s east-west rail link. Russian tanks and hundreds of soldiers remain in four cities, and no one controls the deserted area between them. Ossetian irregular militias, as well as Russian soldiers, are reportedly looting abandoned houses, stores and banks. The hunt is on for journalists or accidental travelers. The only way journalists can get information now is to drive to cities and villages and talk to people. My second reporting trip on this war ended very badly Friday, with an encounter with Ossetian irregular militias. As my husband and I were driving toward Gori, the Georgian city closest to the combat zone, several men in camouflage suddenly emerged from a side road and started shooting. Bearded, with red eyes, holding Kalashnikovs in their hands, they stopped the car and surrounded it. They spoke in Ossetian. One of them, a young man with a wild look, was closest to me and clearly full with hatred. “Georgian? Are you Georgian?” he was shouting in broken Georgian. I told him that I have been working for foreign media. The following conversation was short. “I don’t care about journalists, get out of the car.” A tiny pistol in his hand was pointed directly at my face. A heavy Kalashnikov hung from his neck, in the casual way people wear their cell phones. He got into the car. “Give me at least my camera,” I pleaded. “I am shooting the tragedy on both sides.” He aimed his pistol at me through open window again. I was looking closely in the barrel. I never noticed that the bore was so narrow. We were in a deserted spot. Most of the residents in and around South Ossetia had abandoned their houses last week, after violence began over this breakaway territory. Tens of thousands have become refugees. South Ossetia threw off Georgian control in a bloody war in the early 1990s, and since then Russian peacekeeping forces have been controlling frozen peace as ineffectual negotiations continued in the region. On August 8, Tbilisi unexpectedly launched a massive artillery attack on Tskhinvali, the capital of South Ossetia. Russian forces immediately struck back, attacking Georgia with troops, tanks, planes and warships. Georgian cities, bombed by Russian aircrafts, are now devastated. Thousands of both Ossetians and Georgians civilians are believed to have been killed, though no official numbers yet exist. “You are a journalist, you know more–are they [the West] sending their forces to help us?” asked a policeman I had managed to track down an hour after the encounter with the Ossetia militia. On Friday, US Secretary of State Condoleezza Rice visited Georgia to show Washington’s support. “Russian forces need to leave Georgia at once,” she told reporters in Tbilisi. Such words offer little comfort to the desperate people here; they watch with disappointment the parade of presidents and high-ranking officials who drop in for a few hours, make a statement to the media, then leave. “We need their guns, not words. We need them to help us to fight occupying Russian forces,” said a villager who had given us a ride from the place we were attacked. He was one of three men driving an old, rattling Soviet car that stopped to pick us up; they were from the nearby village of Kareli. They said only a few elderly people remained in their village; everyone else was gone. Dozens of reports of looting by irregular militias and Russian soldiers are coming every day. There is little sign anywhere of the Georgian army. Those columns of Georgian military trucks and thousands of soldiers I watched just ten days ago while driving across the country have disappeared. Police cars are seen only in the cities located far from the war zones. The rest of the countryside is completely unprotected. I discovered that much after my own encounter with Ossetian militias: when I finally got a call through to an official in the Interior Ministry and asked him to send a police car, he recommended instead that I simply walk to the nearest city. Over the past ten days, Russia clearly showed to Georgia and the world that it can easily occupy the entire country at any moment. Now Russian forces control four cities, and from time to time demonstrate their intention to move further, causing panic among population. Russia has said it will give back the Georgian cities under a six-point peace agreement negotiated by Rice and French President Nicolas Sarkozy. But it seems the condition under which Russia will really leave will be changing the status of South Ossetia and Abkhazia. “We can forget about talks on Georgia’s territorial integrity, because it’s impossible to force South Ossetia and Abkhazia to agree that they can be returned into Georgia’s fold by force,” Russian Foreign Minister Sergei Lavrov said. It is likely that Georgia will also have to make a clear promise to never again use military force in the two provinces. When the Russian forces leave Georgia and a new political status is drawn for South Ossetia and Abkhazia, the fundamental question will arise: who started this war? Neither the opposition nor key civil society figures in Georgia nor EU structures have yet investigated who did what before and during the war. But when the Russian occupation is over, they will do it, step by step. Luís Maria de Puig, president of the Parliamentary Assembly of the Council of Europe, said a few days ago that his organization “wishes, in due course, to establish the grave responsibilities borne by each of the parties involved in the conflict. Russia accuses the Georgian government of breaking international humanitarian law with its deadly attack on civilians in Tskhinvali, which led to bombing of Georgian cities by Russian aircrafts and the occupation. New political changes in Georgia seem to be inevitable if such a responsibility of the country’s leaders is established.